I open this topic becouse i know that in T.DR Kuni is only an other suite(clot) of Yoshi...Is it true? and there is some difference betwen Kuny and Yo? Kunimitsu was a playable character in Tekken, Tekken 2 and in Tekken Tag, with her own fighting style that was very similar to that of Yoshimitsu's. 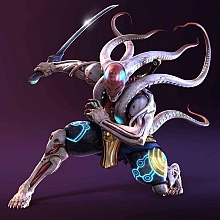 Storyline tells that Yoshimitsu banished her from the Clan after she began disobeying him and stealing for herself. If my memory serves me, she stole from the Clan itself. Afterwards, she studied fixing air conditioners. Why? Dunno. I think she was rather creative, coming up with that. Afterwards, Kunimitsu returned to her grandfather, who was a famous swordsmith. He wanted to make an exact copy of Yoshimitsu's sword that was able to damage the enemies both mentally and physically. She failed. No one has heard of her ever since. There are several theories about her origin and her fate. Some say Yoshimitsu and Kunimitsu are siblings, but I personally don't think so. It is said that they could have been lovers in the past, but then thrown into hatred of each other. Some think they have hated each other to begin with. 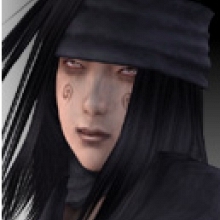 It is also said that Yoshimitsu killed her in Tekken 2, or that she fled and simply vanished from publicity. I, too, represent my own theory in my fan-comic "The Blood Ring", which goes slightly deeper than most of the theories I've heard. I hope I've answered your question, Yoshedo-san. Thanks for this...Now i know kuni-genesi, but in Tekken DR what's happened? Nothing in particular. You can just get Kuni's mask (and hair?) and dagger to Yoshimitsu. I wish Kunimitsu would come back as well. She would do wonders for the story. I agree, I wish Kunimitsu would make a return. For me make only kuni mask in T D.R. was a bad idea! who will use kuni mask in yoshi body? i NO!! It's just a mask. What I want is the tekken 5 extra costume. That would be great, I love the larger sword. In fact, what I really want is a different sword. It's been said that kunimitsu was absorbed by ogre, as his fighting style is similar. Good idea a different sword, but whit game-different between two sword! I do not understand what you said. I doubt they're gonna bring her back... there's no room for third ninja in Tekken, I tell you that.